The Dulles Suburban Center Study is a land use planning study that will update recommendations for future land uses and development. The last Comprehensive review of land use recommendations occurred in 1993. The comprehensive planning study will assess current conditions and the planned land uses of approximately 5,000 acres of land that are adjacent to the Washington-Dulles International Airport along the Route 28 and Route 50 corridors. 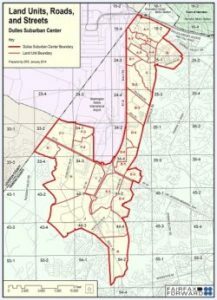 This study will not include Land Units A and B of the Dulles Suburban Center since they were the subject of a recently adopted land use study. The interactive map of Dulles Suburban Center provides a variety of information, including layers showing the location of police and fire stations, schools, bike trails, bus routes, libraries and much more. Click on the "Layers" tab to the left of the map and scroll through the available layers. Please note that some layers are only visible if you zoom in or out on the map. You can also use the "Address Search" feature found below the "Information" tab to locate a specific address and see what features are nearby. If you have any questions about this study, you may contact the Planning Division by phone (703-324-1380, TTY 711 (Virginia Relay)) or email dpzdullessubcenter@fairfaxCounty.gov.